Nokia had two big announcements to make a few months ago. And yes, it’s a matter of perspective but, on certain markets, the S40-powered Asha series can be as big as Windows Phone. 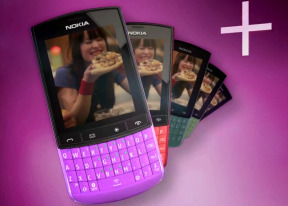 Anyway, now that the Lumia smartphones have had their deserved hype, it’s time for the Asha handsets to step forward. The S40 platform got recently treated to lots of visual updates and the latest feature phones have joined the 1GHz league. The new Asha 303 seem to be sparing no effort to bring the complete user experience to traditionally loyal Nokia markets. At first, it felt strange, but a few minutes into it, we knew we were with a friend. The Asha 303 offers the familiar convenience of Touch and Type phones, but comes with a slightly bigger screen and – most importantly – a full QWERTY keyboard. With a connectivity set that borders on premium and a powerful 1GHz processor, the Asha 303 is ready to lead a Nokia return to markets the Finns like to call their own.. The Asha 303 is in charge of a lineup that tries to cover the entire range of the low end. From a basic Dual SIM solution to different combinations of touchscreen and QWERTY and cameras ranging from 2 to 5 megapixel – there should be a phone for every use and budget. Save for the 3.2 megapixel camera (it’s fixed-focus across the range), the Asha 303 is the best equipped handset of the lineup. Not only is it the first QWERTY/touchscreen S40 phone, the capacitive display is a debut for the platform. The penta-band 3G support along with Wi-Fi and USB-on-the-go are worthy of a smartphone. The Asha 303 is not a smartphone of course and the biggest omission is multitasking. Nokia’s S40 have never had that and it seems a shame that the 1GHz processor will never be really tested. Smart dialing is another No on the list – would’ve been a nice thing to have on a QWERTY phone. Other than that, the Asha 303 is more than adequately equipped to be an excellent competitor in its class. Let’s see if this messenger delivers on time – and on price. Coming up next is our traditional tour of the exterior.